One of my least favourite forms of writing at this time of the year is the obligatory publishing of lists: top stories of the year, best movies, worst songs, and, if you're inclined to watch television news in the Vancouver market, no doubt the biggest weather stories of the year. Oh, how we love a good weather story on our local news channel, as I've alluded to in the recent past. Never mind that the most severe of our local weather phenomena generally involves nothing more than extreme windiness or, if the assignment editor is really fortuitous, any amount of snowfall (pictures of cars in ditches and spinning, worn-out all-season tires always lead that newscast). It's also the time of year for predictions: when a federal or provincial election will be called, who's likely to run/get eliminated by scandal/win one (municipal are pre-scheduled but 2014 is one of those years so lists will contain 'guess the mayor' as well); which celebrities will marry/divorce/violate a federal statute; interest rates will go up/down/stay the same/wait - I didn't need that last slash - there's pretty much no other option. And of course, there's the endless resolutions stories. Sometimes we want to know what famous or powerful are planning to do to improve themselves (gotta think for Justin Bieber it's pretty much everything). Then there's the ultimate lazy journalism story: ask people on the street what their resolutions are. I promise, at least, that my list of resolutions - short though it may be - will be focused on those related to writing. Given that the stated intent of this weekly column is to keep me generating written output - even if it's not always directly related to W3.doc, it seems natural that after a year of uninterrupted, weekly production I pause to take stock of what's happened so far and what hopefully lies ahead. And given the time of year, no writer likes to work too hard, which is why these types of columns are often broken into two parts. 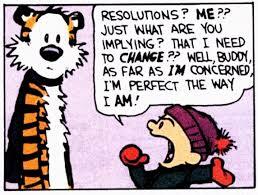 Thus - the resolutions themselves, I reserve for next week. Next week: an epiphany of sorts driving the resolutions.